Are vertebrates. They have an internal bony skeleton. Are cold-blooded. They cannot maintain their body temperature by internal means. Have a dry, scaly skin or a shell. Lay their eggs on land. Have claws on their toes (except snakes). Q: Is this snake venomous? > Unless it has a rattle, probably not. We only have 5 venomous snakes in Kansas: 3 rattlesnakes (Prairie, Massasauga, and Timber), the Copperhead, and the Cottonmouth. Despite wide claims of sightings, the Cottonmouth has only been documented in ONE county in Kansas (Cherokee), so that dark gray or black snake swimming in the water is almost certainly a harmless watersnake. 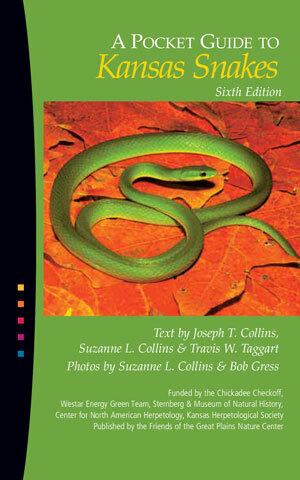 Kansas has 42 species of snakes and they are the most diverse group of reptiles in our state. Fourteen of these have a distribution nearly statewide. These are the creatures you might encounter while hiking the prairies, canyons, and forests. Are snakes faster than me? Snakes cannot crawl faster than a person can walk (it just seems that way to some adrenaline-driven individuals when they unexpectedly encounter one of these reptiles). Snakes don’t milk cows (snake teeth are very sharp and cows won't stand for it). Wait, why are Western Diamond-backed Rattlesnakes on the list?! An unknown number of adults were illegally released into Kanopolis State Park here in Kansas. Ongoing research is being conducted to understand whether this is a breeding population and how many individuals are located there. These are deadly snakes, so if you're traveling to this state park, use reasonable caution and stay on the trails. Gophersnakes are considered the most economically beneficial snake in Kansas, because of the enormous numbers of rodent pests they consume in agricultural fields. These fast little reptiles come in many shapes and sizes, but they always have eyelids, tails, ear holes, and (usually) legs. Do lizards break their tails off? Some of them do! Some lizards can also regenerate the lost part of their tail. Special muscles break the tail off and prevent blood loss, and the wiggly tail left behind serves as a decoy for the predator or human that was bothering it. YES. These lizards look a lot like snakes... until they wink at you. If you see eyelids, ear holes, and no forked tongue, you're looking at a lizard. Collared Lizards change color over the seasons. Males become brighter in breeding season, and females develop orange stripes when they're carrying eggs. Turtles are reptiles with a specialized bony shell, their modified ribcage. They may live on land or in water, and some even have hinged bottom shells to shut out predators. They're either looking for a new habitat or trying to find a good spot for laying eggs. Do not risk your own safety, but if it's safe to help out, just move them to the side they're trying to reach. I found a turtle! What should I do? Congrats! Pat it on the back and let it go back to being a wild turtle. If you need to move a turtle to a new location, please don't throw turtles into the water. Not all turtles live there, and even the water-dwelling turtles can be shocked by being chucked into a pond. Which turtles live on land? The Ornate Box Turtle and Eastern Box Turtle are the only terrestrial turtles in Kansas. The ornate box turtle prefers prairies and pastures over forest; it is found from South Dakota to southern Arizona and the Rio Grande valley (the Mississippi river generally marks the eastern boundary of its range). It is illegal in Kansas to take turtles from the wild to keep as pets. Want to learn more? 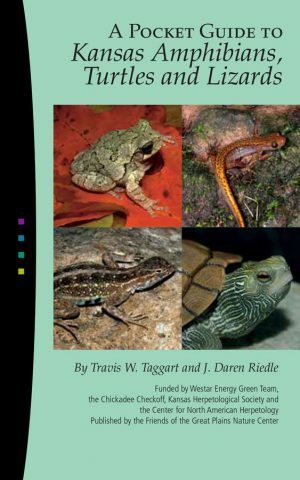 Download our free Pocket Guides to Kansas Reptiles! Take these with you on your device wherever you go, or pick up your own pocket-sized copy at our front desk during your next visit.